Rising along with Korea’s burgeoning entrepreneurship ecosystem, Seoul-based WAHA Offices – a serviced office and business incubator hybrid office solutions targeted at startup companies – last week opened its third location, after its first in Seoul’s Gangam district and its second in Singapore. 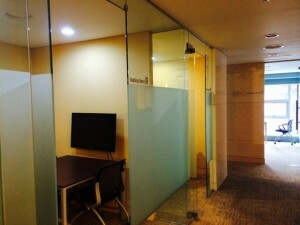 First set up in 2013, WAHA Offices‘ third outlet continues its aim of serving as a business accelerator, offers programs with business matchmaking services and venture capital introduction run by One Asia Investment Partners and Asia Founders, along with providing consulting and administrative services to help partner startups grow at a quicker pace. “Asia is a high growth area that has a lively scene of budding entrepreneurs, which makes it an ideal location to provide the right infrastructure and support for startups to grow – especially at the crucial stages of market expansion to overcome growing pains and develop into stable and successful companies”, says WAHA CEO Joe Cho, who revealed plans to open up eight more offices by year’s end in locations including New York City, Bangkok, San Francisco, Ulaanbaatar (Mongolia), Phnom Penh, Kuala Lumpur and Ho Chi Minh City. “We see ourselves as partners as we aim to help firms to accelerate their growth. That’s why we want to be in key locations, including London, New York and San Francisco in the short-term. Our strong presence across Asia will allow our clients to expand and grow at an accelerated pace, utilizing WAHA’s strong network across the region and benefiting from hassle-free access to foreign markets,” he adds. The company believes that their accelerator programs not only benefit new startups, but can also apply for small, stable businesses that require additional support to push them to another level. “At WAHA we are constantly looking at how we can offer more specialised services to our clients and can also benefit from working with fellow startups from similar industries and learn together,” states Cho.